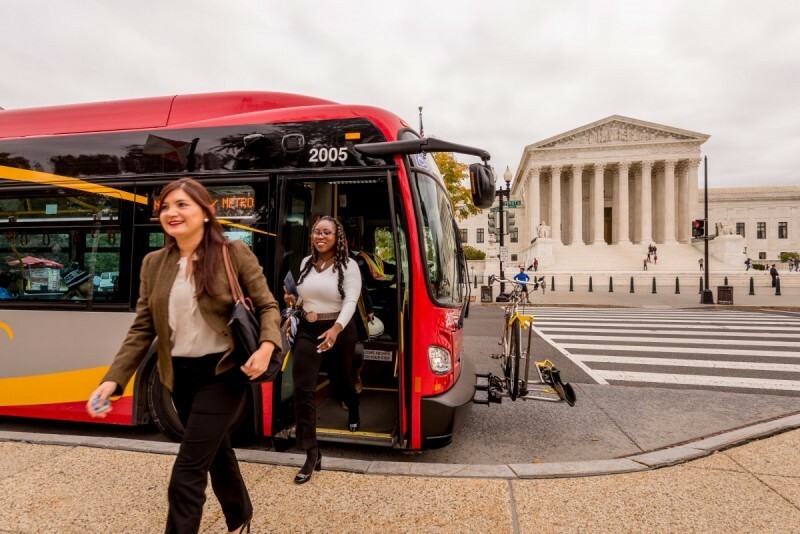 Changes to DC Circulator could bring the DC-run bus service to Congress Heights, L'Enfant Plaza, U Street/Howard University, but remove it from Skyland, Wisconsin Avenue, and Potomac Avenue. What do you think? The Circulator has been struggling to meet its performance goals. According to a recent audit, a third of the Circulator's 67 buses have been out of service on the average day. As a result, buses are only arriving every 15 minutes or less 76% of the time. When the Circulator was first created, the goal was to have them 10 minutes apart (and that's still what the Circulator website says). There's a long way to go to get Circulator performance back to what it should be. The main way DDOT hopes to achieve that is a new bus maintenance facility, as the current one is too small. There have also been issues with the maintenance work from First Transit, the Circulator contractor. DDOT has been working through a procurement process to get a new facility, which the District will control instead of First Transit. Complaints on the Circulator are also above DDOT's target; the system got 0.37 complaints per 10,000 riders in 2016 versus a goal of 0.2. The farebox recovery ratio (the percentage of the systems' costs paid for by fares) is just 16% versus a target of 25%. (If you think that's low, it is, but also remember that the farebox recovery ratio of driving on almost all roads is zero). 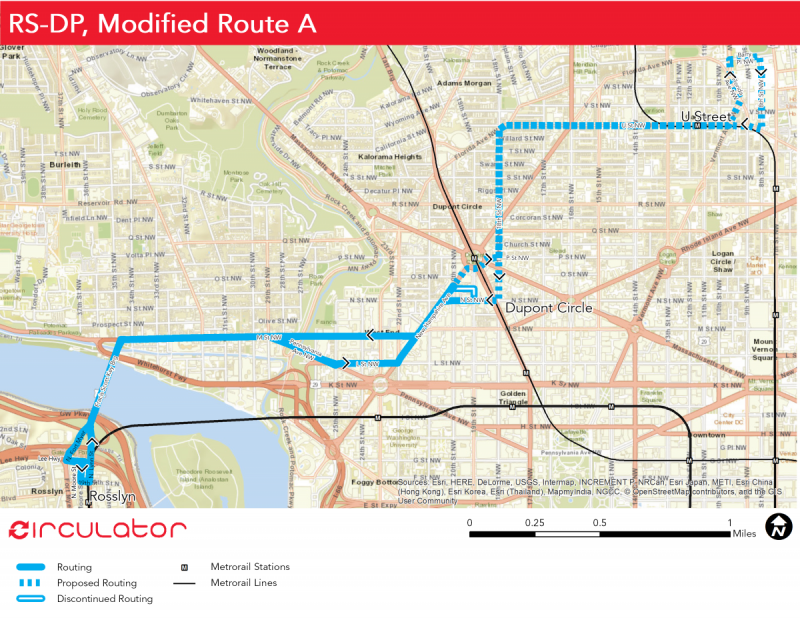 The Potomac Avenue-Skyland route, which runs through Capitol Hill, Historic Anacostia, and neighborhoods to the east, is performing the worst of all Circulator lines, with just a 8% ratio. 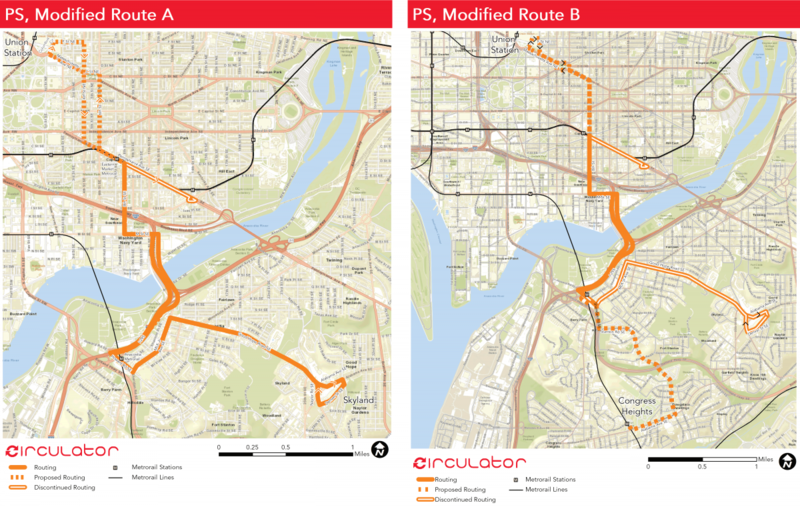 The Circulator planners want to keep service east of the Anacostia but have two ideas to improve the line. The first would be to connect it to Union Station after passing through Barracks Row, instead of turning right on Pennsylvania Avenue to go to Potomac Avenue Metro. While the initial idea was to help people get to the Harris Teeter, planners think going to Union Station would be more useful. Plus, then there would be a line directly from Union Station to the east gate of the Navy Yard, where Navy employees generally enter. The second idea is to take Stanton Road to Congress Heights instead of Good Hope Road to Skyland. The reason for going to Skyland was because a large mixed-use development was supposed to happen there; it unfortunately didn't. Also, Metro has pretty robust bus service on Good Hope Road on the 92 Metrobus. Instead, DDOT proposes having the Circulator take over the current Metrobus 94 route on Stanton Road. A Circulator to Congress Heights would help people get to the upcoming sports complex at St. Elizabeths as well as Congress Heights Metro and serving people in the neighborhood. The second least productive route is Union Station-Navy Yard, garnering 9% farebox recovery. There's a role for Circulator bus service in the Capitol Riverfront area, but two potential issues. First, the bus goes from Union Station and then winds through the Capitol complex before continuing to Barracks Row and then the Navy Yard Metro. Congress prohibits vehicles on First Street north of Constitution or south of Independence, where the Senate and House office buildings are, so the bus wiggles around there in order to still get to the Capitol Visitors' Center. That adds a lot of extra time, making the whole fairly short route still take 30 minutes. Most tourists going to the Capitol just walk from Metro anyway, so DDOT planners feel it's not necessary to get to the visitors' center. 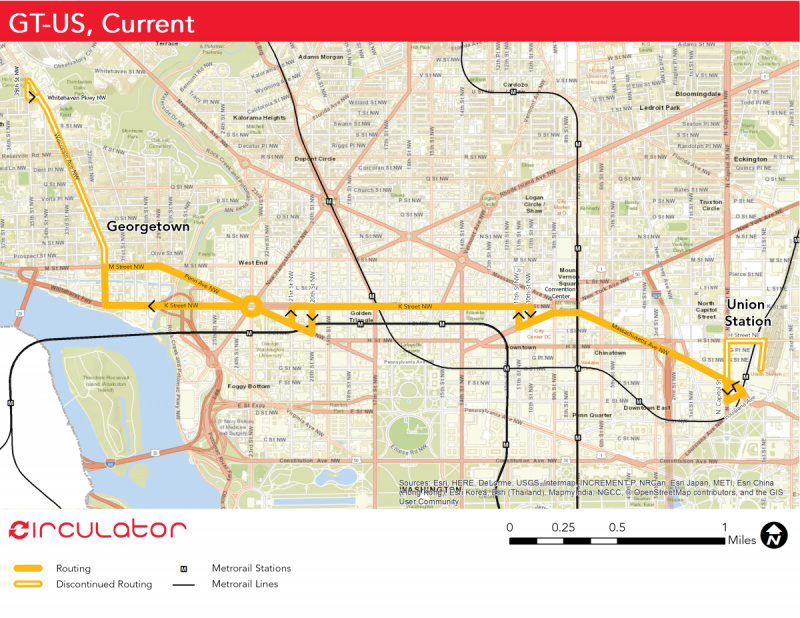 Also, there is demand for Circulator service in the Southwest area, especially with the imminent openings of the Wharf development on Maine Avenue, the Spy Museum at L'Enfant Plaza, and the Museum of the Bible. Therefore, one option would be to change the route around entirely and run from Eastern Market to Navy Yard, then across to Waterfront, and finally up to L'Enfant Plaza. This would restore some of the original 7th Street north-south Circulator that was part of the original plan of the system. This route could also deviate a few blocks (just one way, unfortunately) on soccer game days to serve the upcoming soccer stadium at Buzzard Point. This bus would no longer connect Union Station to Eastern Market and the Navy Yard, but the modified Potomac Avenue-Skyland route (perhaps to be called Congress Heights-Union Station if the changes happen) would fill that gap instead. The only original Circulator route that's been continuously operating since the system started is the east-west route mainly on K Street. 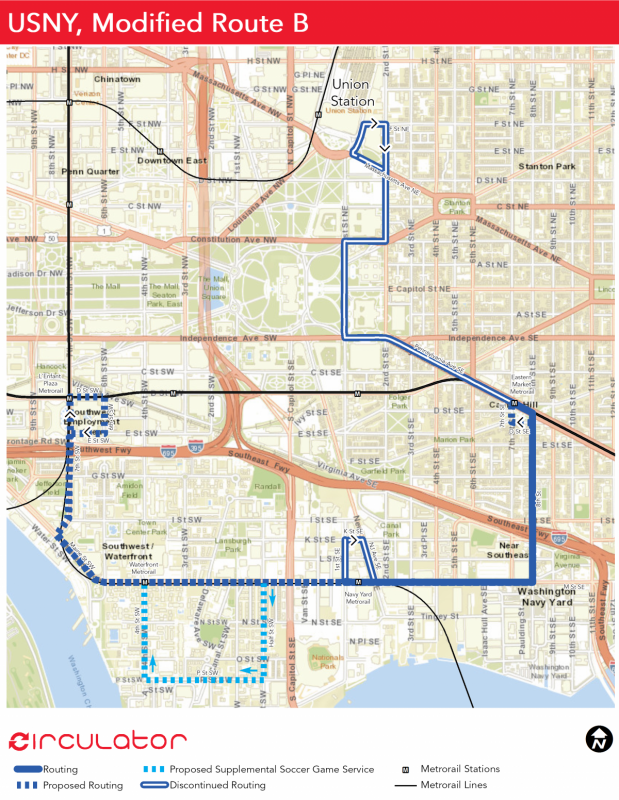 Today, buses turn up Wisconsin Avenue to Whitehaven Parkway (and Ward 3 councilmember Mary Cheh asked for the route to extend even further up to the Cathedral). Bus planners have just as continually said that part of the route performs poorly, especially since there are already many 30s buses on Wisconsin Avenue. Therefore, DDOT is again proposing to end the route at M and Wisconsin. Planners also want to make the route stop by Columbus Circle just west of Union Station, in the same spot as the Mall route does today. In fact, many riders transfer from the east-west Circulator route to the Mall route. It would also save a lot of time versus driving into the Union Station garage. There's one big expansion on the plan: DDOT wants to extend the current Rosslyn-Georgetown-Dupont Circle route to U Street and Howard University. Now, the bus ends on the south side of Dupont Circle. If approved, the route would pass through or by the circle, up 18th Street to U Street, and then over to 8th St and Barry Place NW by Howard. This would require about 3-4 more buses, which the team says could be freed up by cutting the Wisconsin Avenue segment of the Georgetown-Union Station line. That means a choice for Georgetowners and other residents: is it better to have the bus on Wisconsin or U Street? The route on the Mall has almost no riders in the months of January and February. DDOT considered cutting the route during those months, which would save $400,000 a year. However, the National Park Service does not want to do that (and is paying some of the cost of the bus). Another danger is that if a bus doesn't run year round, it can get fewer riders at the other times of the year. The agency has been talking to riders in person; last weekend, representatives were in Georgetown and at the Dupont Farmer's Market. Upcoming events include at Anacostia Metro on Wednesday, June 7, 3:30-6:30 pm; at MarketSW, 401 M St SW, on Friday, June 9 from 4 to 7 pm; and at Truckeroo on Friday, June 16 (1299 Half Street, SE), 11 am to 2 pm. You can give DDOT feedback on a survey in English or Spanish. And, of course, give your thoughts here in the comments!